It's been two years since I first went public (and mini-viral) with the world's first, fully 3D printed fly fishing reel. Field & Stream Magazine fly fishing editor Joe Cermele first blogged about my reels and then asked me for one to test. He put together this awesome video. A few months later I made some major (and innovative) updates to the design - I called this the V5 design. I make the STL files and detailed instructions freely available but I do ask you to agree to a few simple terms. Over 2500 fly fisherman and 3D printing enthusiasts from all across the globe have downloaded the files. In the summer of 2015, following publication of my article A 3D-Printed Fly-Fishing Reel with Click Check in their Journal, I was asked to present at the American Museum of Fly Fishing in Manchester, Vt. I donated my very first "alpha" reel and the first V5 reel to the museum to be part of their permanent collection. 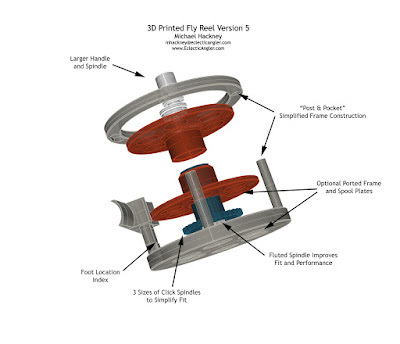 They also bestowed the titles "world's lightest 4 weight fly reel" and "first 3D printed fly reel" on my work. Over the last year I've learned a lot about the reel from all of my great users and even more about "design to 3D print". Although the V5 reel is quite robust there were a few areas that I wanted to improve to allow the reel to handle larger fish and be more robust. 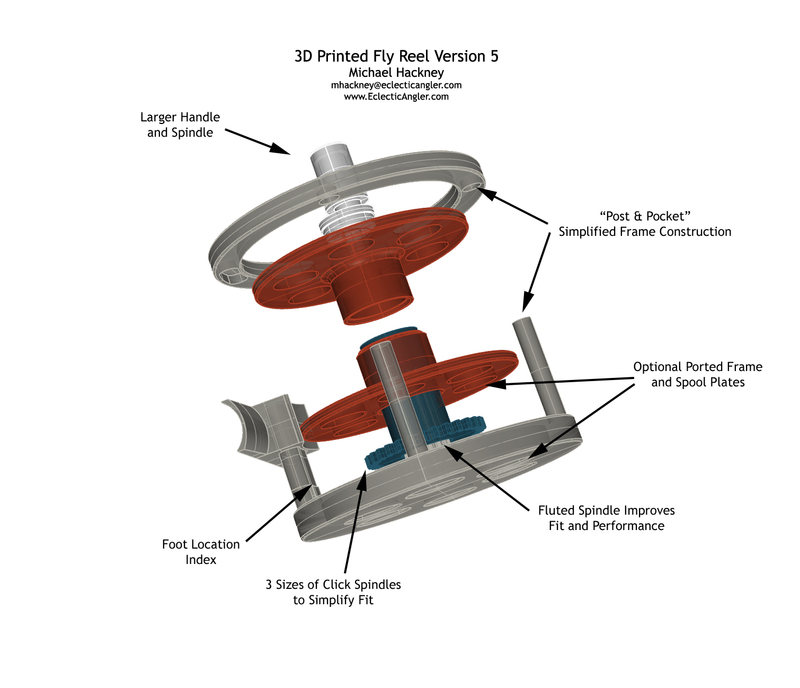 I've completed the iteration, design and testing work and now I'm ready to publish my new V6 3D Printed Fly Reel. It has quite a few changes and innovations that distinguish it from its predecessor as you can see. I'll walk through the major changes but there are dozens of little tweaks to dimensions, etc to improve printability. Ovalized Pillars - this modification not only makes the pillars (specifically the pillar to backplate junction) much stronger but also really improves printability. The pillars also have a small fillet at their base to improve strength. My informal break tests lead me to conclude that this new design is at least 3-4 times stronger than the V5 design. That's a major improvement. Conical Spindle Base - this design change improves strength of the spindle-to-backplate junction, greatly improves printability and allows the spool to rotate more freely. 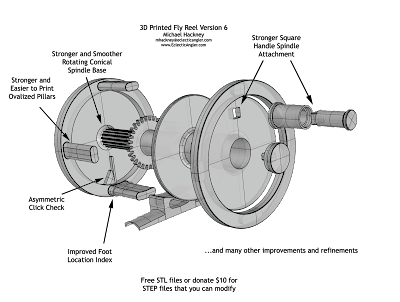 Square Handle Spindle Attachment - the handle spindle attachment to the spool plate was a weak link in the V5 design. I struggled with this one and tested a lot of ideas. This simple square boss and hole did the trick! Improved Foot Index - this positions the foot accurately on the reel. The earlier V5 design did not allow the foot to seat accurately or firmly. In addition, a small fillet at the base of the boot pillar significantly improves strength. Asymmetric Click Check - I developed this innovation for my aluminum fly reel kits but it works just as well on the 3D printed reel. There will be three versions of the backplate - one for left hand retrieve, one for right hand retrieve and a simple symmetrical version like the V5. Not shown in the diagram is a Friction Pad opposite the click check. This element supports the spool opposite the click check pawl to prevent the spool from binding when retrieving a large fish. My daughter's boy friend Brian actually came up with the idea when I had him beta test assembling one of my aluminum reel kits last autumn. Smart guy! Along with these enhancements there will be a few other surprises mostly around design elements like porting. Stay tuned for the release sometime in the next week or so (I need to finish the Assembly Guide for the V6 design). I'd like to thank the many supporters for their kind donations to help continue funding my work. After some consideration, I've decided to offer the STEP files for the complete V6 reel for a $10 donation. This will allow users to customize the reel, tesselate it (mesh) themselves, as well as learn a little about design for 3D printing. 4 comments to ''Presenting my all-new V6 3D printed fly fishing reel"
I haven't completed all of the documentation and "extras" that I want to do before publishing them. I'm working on a replaceable insert in the back plate so those who donate for the STEP files can create unique logos, scripts, etc to customize the reels. Stay tuned, should be done this weekend. Oh, and the Core X-Y is coming along slowly. Now that the Christmas season is behind me, I have more time. I had a lot of orders for reel kits, etc this year - a good thing.